This site is an unregulated site located on the Cuesta Ridge west of Highway 101. 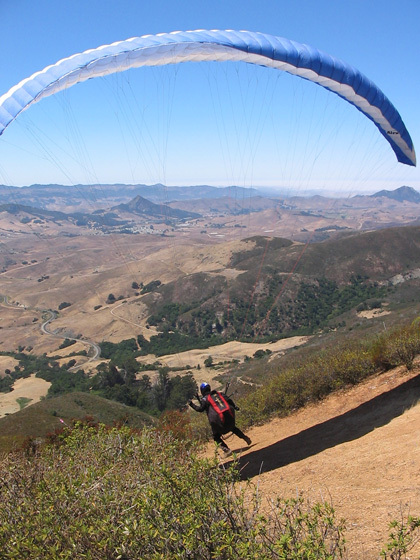 Cuesta offers the closest high launch thermal opportunities in the San Luis Obispo area. The Launch is located in Federal Forest Lands located on TV Tower Road off of Highway 101. The Launch and its access roads are owned by a number of private and public entities. Much of the Valley below is private ranch lands and the owners have not officially authorized or encouraged their lands for use as landing areas. This includes the preferred LZ adjacent and to the west of a small parking area along a county road leading up to the ranch headquarter above. Always use gates when possible and leave them as you find them. When a gate is not available, use reinforced fence areas to cross over. 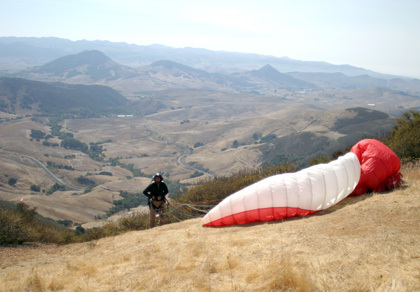 Paragliders can use an open fenced field just east of the Farm Headquarters which is owned by Cal Poly. Drive carefully on access roads to the Launch and LZ parking area as they are popular roads for biking and running. Special Note: We have only the forbearance of the property owners and no official authority to fly this site. 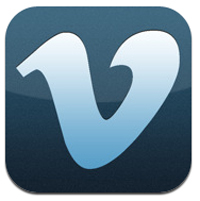 This site is a sensitive site and we ask that all that use it be respectful to the site and its neighbors. Pilots should have a P-3 or H-3 to fly the site. P2 or H2 with Instructor Supervision. All pilots must wear a helmet and reserve parachute. All flights must be in accordance with FAR Part 103. Highly recommended that new pilots should be accompanied and checked out on hazards and appropriate use of this site by knowledgeable local pilots before flying this site. Significant rotor can be encountered behind ridges and at gully transitions. Wind can increase in strength, rapidly in the afternoon which can blow back pilots into rotor zones behind ridges. Top Landing is possible, but can be tricky in thermal conditions. Can launch in South to NW winds. Thermals tend to be best with light southerly winds and clear skies conditions most common in late fall to early spring. 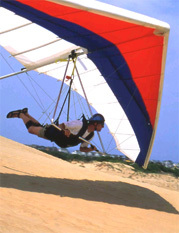 Thermal cycles usually start around noon but winds tend to get too strong in the middle afternoon for Paragliders. Thermal conditions allow climbs to over 5000' but often climbs are limited by inversions to 3500'. XC flights are possible to the NW and SW along the mountain ridge with increasingly remote accessibility as one moves way from the launch area. Get checked out by experienced pilots in the area before proceeding. Copyright 2005 © All Rights Reserved All code, design, style, layout and hosting is provided by Vantage Technology Group, Inc. No part of this website or the operational code may be copied or duplicated without written permission from San Luis Soaring Assn..